18SEP16 – RIO DE JANEIRO – BRASIL.- Sitting in my ‘mini’ office or room, as in the middle of so many computers, cables and notes it cannot be differed, (it is an hotel, in front of Copacabana with views which invite you to dream); I think to myself, store and select all the information that I have received in the last hours. Interviews, audios, photographs, new contacts’ cards, pending reports and The Favelas. I cannot help it; I visited them tonight, when I finished at the Olympic Park. 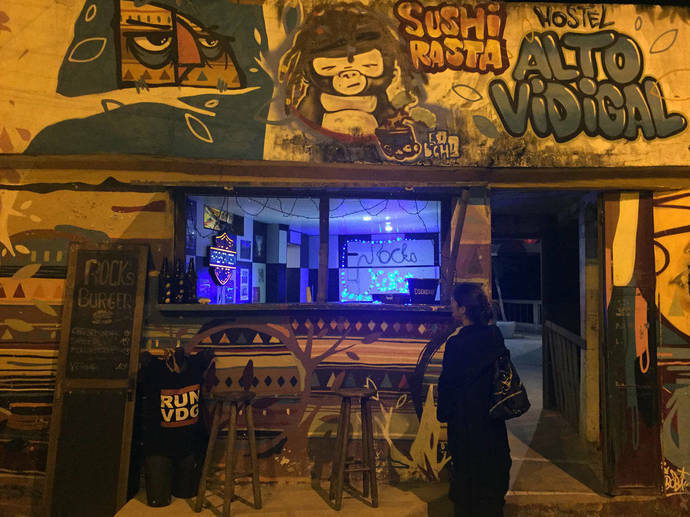 I have been in two of the best known, Rocinha and Vidigal. I did not come alone, my driver-guide- guard angel Linoaldo went with me. This poor dear guy makes a little bit of everything and a lot of nothing. When I hired him, neither he nor I could imagine, that four days after meeting each other, we would have a walk at the favelas one night, sharing one of the memories, which will inerasably remain for all my life….and surely his. Maybe, mixed with the chronicles of the Paralympic games, I must write about sand, volleyball, cocktails…What is normal when you travel to Rio de Janeiro, is to rest in any of its beautiful beaches, enjoy the gastronomy, and other activities the city offers, but my inner curiosity decides for myself, making me live “moments” that are but “which anybody sees” …and talk about them. Last night, at the top of the Favela Vidigal, sharing one of the most beautiful images, that I will take with me from Rio de Janeiro, I asked Linoaldo if he was still going to treat me as a tourist, and maybe it was because of the tension while we walked across art of the favela or maybe because of the surrealistic character of the situation, that we started to laugh without being able to stop. It was for me an unforgettable ‘moment’. 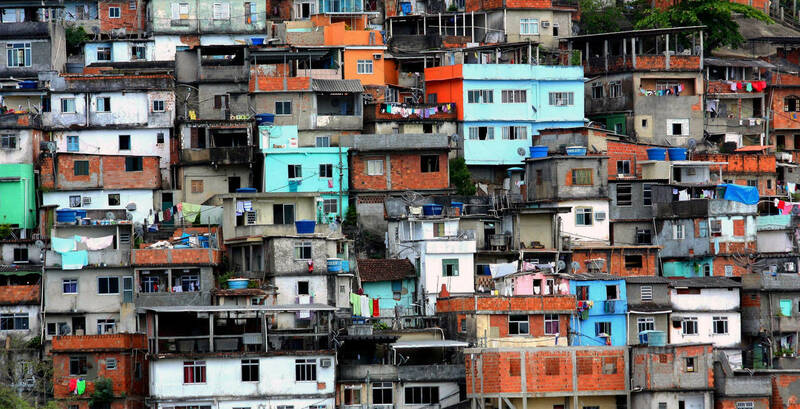 A lot has been said about the Favelas in Rio de Janeiro. Together with the Olympics, they filled the headlines in the media. “Favelas” and Olympics in the same headline calls the attention of the audience for sure, sometimes I wonder up until what point the information is manipulated to all the interest, because after what I saw yesterday night, I sincerely do not believe it has been a massive accommodation place for the tourists attending to the games of Rio 2016. I have researched a little, surfing on the net, getting to find videos of the peace that can be breathed in “these communities”. If you do not mind I will describe my night walk, it is possible that each reader senses differently, I only know that I was there, that I look at the eyes of hundreds of people who I passed by, women, men, elderly people, children and teenagers. We arrived at Rocinha around 21:00. Here, sun sets around 18:00 so that at that hour, there was little light, only and very scarcely, some light bulbs, which illuminated the main streets. 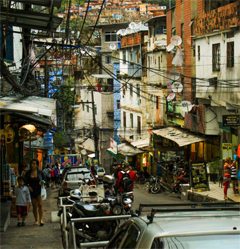 Rocinha is located quite near the Olympic Park, it is the largest favela, not only in Rio de Janeiro but, from the whole south America. A main street crosses going up the whole community. Along it, many forks lead you within, the sight gets lost among small businesses. A square meter there can be a supermarket, a hairdresser’s, a pizza place, a motorcycle garage, a butcher’s, a dentist, a greengrocer’s and above all it’s chaotic, without order or logic. Pretty clearly, it can be guessed that the Favelas, are self-sufficient, independent from the world outside, in their disorder they may find everything they need. I notice the chaos in buildings and businesses. When I observe the houses, the unhealthy conditions stand out, dirt beats your sight, it does not matter where you may look at, it takes up everything, the facades, windows, doors, chairs…In a kind of porch with two chairs and a small table (some of them made out of plastic boxes) are the common characteristics of the “houses”, “bars” and “stores” that I find there. My sight unavoidably stops in empty containers and dust bags building mountains in the corners. On the other hand, the odour is a mixture between burned fuel of the motocabs, litter piled in the streets, hot dogs, fry-up from the minibars…During the brief walk through Rocinha, my eyes crosswith the ones which stare at me and study me, because although I want to go unnoticed among these people, it’s impossible, I’m in their area, and when I go pass them, without words they ask, “What are you doing?” With that same look that invites me to go away. She is writer of travel and tourism, and has worked for a long time on radio, local TV of Andalusia, fashion magazines, local newspapers and shared space with great professionals of the media from whom she has learned, as she points out, the ins and outs of this professional scene. As a usual traveller, she likes to know different places and imbibe their culture and customs that she later turns in newspaper articles with a personal stamp and a vision of 'direct witness'. He has written about food, culture, fashion, economy and travel and believes that the best way to generate progress is the creation of synergies among the different sectors which lend their enthusiastic support for tourism projects, fashion and above all, culture. She points that a society without culture is doomed to stagnation. Maica Rivera lives between Madrid and Córdoba - Andalusia.